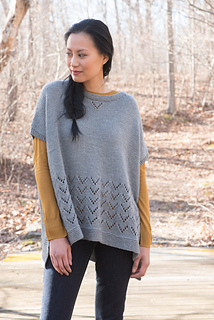 Knit seamlessly from the bottom up, Elizabeth Smith’s oversized poncho features a simple lace repeat to add visual interest to a cozy layering garment. Directions are for women’s size Small/Medium. Changes for sizes Large/X-Large and 2X/3X are in parentheses. Note: This garment was designed with considerable positive ease. Choose a size based on the “To Fit Bust Size” measurements. 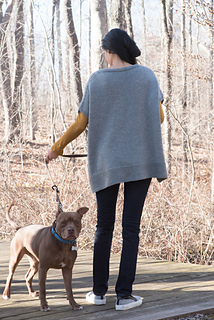 Poncho is knit from the bottom-up, featuring a split hem with longer back. 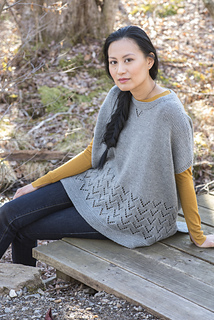 Each front and back hem is worked separately and then joined to work in the round after the split. Body is worked in one piece to the underarms, then each front/back is worked separately to the shoulders. 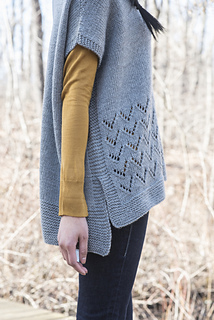 The 3 needle bind-off is used to attach front and back shoulders together.